All photos are by and courtesy of Ryan Bates. The #29 is the newest locomotive on the Ryan's layout. The tight curves on the current layout generally prohibit operations of 6-axle locomotives, forcing Ryan to substitue this Stewart AS-16 for the "real" railroad's fleet of DRS-6-6-1500's and AS-616's. 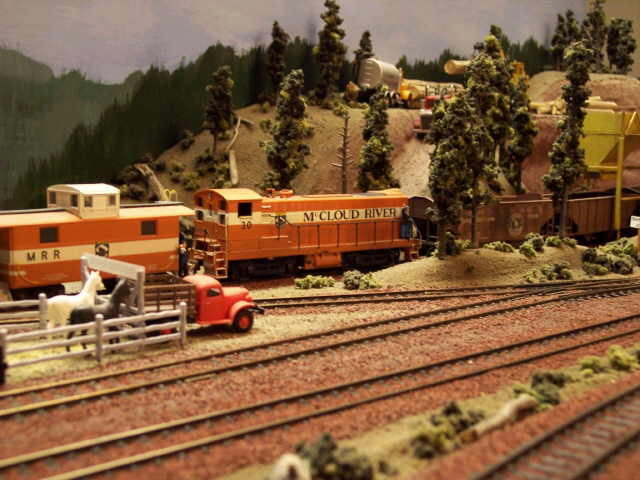 The #29 is seen here in the McCloud yard with a Great Northern caboose. 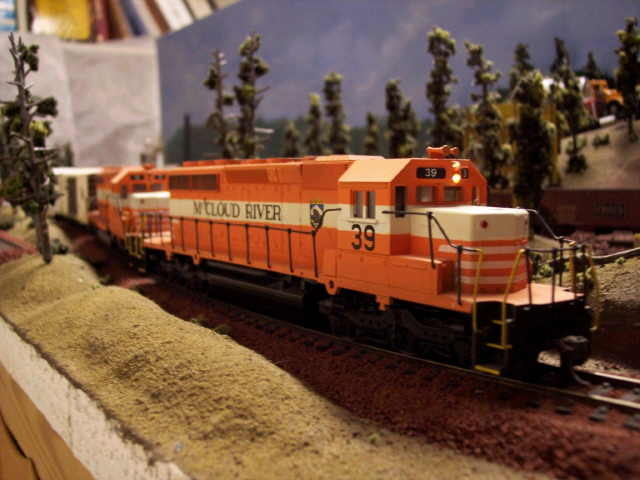 The #30 is an Athearn-made Baldwin S-12 switcher that has been painted into the new orange and white paint. It is seen here spotting empty ballast hoppers into the quarry. Ryan's caboose, painted to match the new scheme, is along for the ride. The #31 is another Athearn-made Baldwin S-12 switcher, still wearing the old paint job. 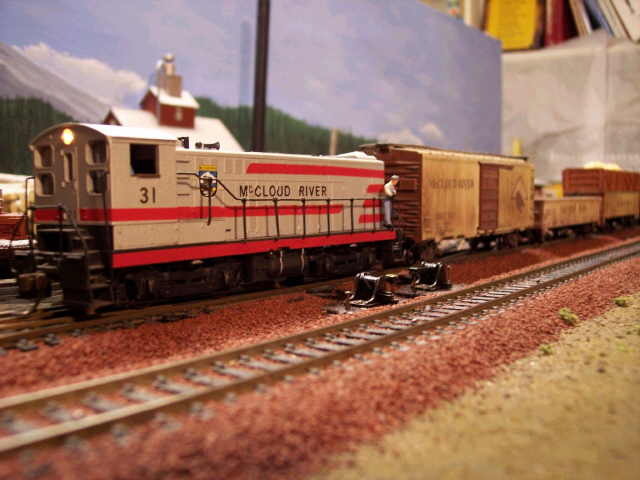 It is seen here switching a cut of McCloud freight cars in the McCloud yard. To date, Ryan has not built models of the #36 or #37. The #38 and #39 have been built, and are seen here on the layout. Both are Athearn EMD SD40-2's, made shortly before Rail Power Products came out with their SD38 shell. These locomotives are not used much on the current layout due to their 6-axle trucks. The #40 is an Athearn EMD SDP40, and it wears a variation of the "new" orange and white paint. Like the #38 and #39, its six axle trucks restrict what it can do on the current layout. In Ryan's world the #40 is still equipped with a steam generator, and it is used primarily on the passenger excursions that the road operates, such as this special passing through the McCloud yard. #41- (Not Pictured) Ryan's McCloud is involved in the locomotive leasing business, and his #41 is assigned to McCloud Rail Services, the leasing arm of his operation. It is an Athearn GE U30C, obtained by Union Pacific as part of payment for shop work that Ryan's road did for that company. The #42 is an Athearn GP-35, nicknamed "Bones" on Ryan's railroad. On the current 1969 version the locomotive is just another product of EMD in service on the line; when Ryan is able to expand his empire and advance the date to around 2001, this locomotive will have been "found" on an abandoned siding out in the woods east of McCloud. Unwanted by its original owners, Ryan's McCloud simply painted it up and added it to the roster. It is seen here pushing the snowplow through the McCloud yard. The "snowplow" is built around the frame of a track cleaning car, and it comes close to representing the "real" railroad's pair of bucker/flangers (#1751 and #1753), albeit greatly lengthened.